We are delighted to have secured funding from the Kilkenny County Council Amenity Grants Scheme to start work on garden plans for the ‘Upper Paddock’ (the open space above The Quay car park) and the ‘Lower Paddock’ (the area off The Quay car park below). The Upper Paddock is destined to become a Biodiversity Community Garden. Mark Hickey, of Davidson Hickey Surveying Consultants in Thomastown, donated his time to prepare a survey of the site. 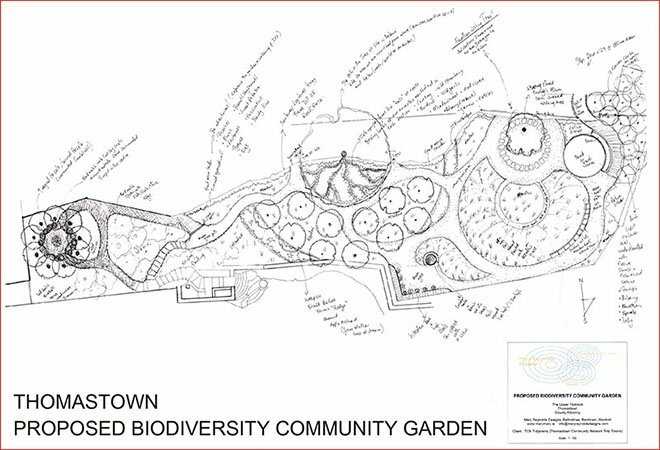 The well-known nature activist and landscape designer Mary Reynolds (www.marymary.ie) was commissioned to draw up a master plan for the site (as shown in the image above). The Lower Paddock will be based on a circular design with benches, beech hedging, and fruit trees. We are calling for ‘Guardians’ of this land, to become involved in implementing the design. If you would like to help, please contact us, and we will get back to you shortly.